The new Legacy edition of "From Elvis In Memphis" will now feature 36 tracks - including the original mono single masters. CD 2 which was to feature the 10 songs of the LP ‘Back In Memphis’ are augmented by another 10 bonus tracks, grouped as "The Original Mono Single Masters". Four are (mono) reprises of songs that appeared on the aforementioned LPs: "In The Ghetto," "Any Day Now," "The Fair’s Moving On," and "You’ll Think Of Me." The other six were all originally non-LP single sides at the time of their first release: "Suspicious Minds" (the Grammy Hall Of Fame and Rock And Roll Hall Of Fame inductee, written by Mark James); "Don’t Cry Daddy" (Mac Davis) b/w "Rubberneckin’"; Eddie Rabbitt’s "Kentucky Rain" b/w Shirl Milete’s "My Little Friend"; and finally, guitarist Johnny Christopher’s "Mama Liked The Roses." Elvis Presley’s multi-faceted performing career underwent a heroic rebirth in 1968 and 1969, ignited by three factors: his NBC-TV "comeback" special of December 1968 (taped in June, his first live show before an audience in over seven years); his landmark sessions at Chip Moman’s American Studios in January-February 1969 (Elvis’ first official recording in his hometown of Memphis since leaving Sun Records in November 1955); and his triumphant return to Las Vegas in August 1969, which led to his return to touring for the rest of his life. 1. Wearin’ That Loved On Look • 2. Only The Strong Survive • 3. I’ll Hold You In My Heart (Till I Can Hold You In My Arms) • 4. Long Black Limousine • 5. It Keeps Right On A-Hurtin’ • 6. I’m Movin’ On • 7. Power Of My Love • 8. Gentle On My Mind • 9. After Loving You • 10. True Love Travels On A Gravel Road • 11. Any Day Now • 12. In The Ghetto • Bonus tracks: 13. I’ll Be There • 14. Hey Jude • 15. If I’m A Fool (For Loving You) • 16. Who Am I? Notes: Tracks 1-12 from From Elvis In Memphis, originally issued June 1969, as RCA 4155. Tracks 13 & 15 from Let’s Be Friends, originally issued April 1970, as Camden 2408. Track 14 from Elvis Now, originally issued February 1972, as RCA 4671. Track 16 from You’ll Never Walk Alone, originally issued March 1971, as Camden 2472. 1. Inherit The Wind • 2. This Is The Story • 3. Stranger In My Own Home Town • 4. A Little Bit Of Green • 5. And The Grass Won’t Pay No Mind • 6. Do You Know Who I Am? • 7. From A Jack To A King • 8. The Fair’s Moving On • 9. You’ll Think Of Me • 10. Without Love (There Is Nothing) • Bonus tracks – The Original Mono Single Masters: 11. In The Ghetto • 12. Any Day Now • 13. The Fair’s Moving On • 14. Suspicious Minds • 15. You’ll Think Of Me • 16. Don’t Cry Daddy • 17. Rubberneckin’ • 18. Kentucky Rain • 19. My Little Friend • 20. Mama Liked The Roses. Notes: Tracks 1-10 from LP Two of the double-LP From Memphis To Vegas/From Vegas To Memphis, originally issued November 1969, as RCA 6020; tracks 1-10 re-released November 1970 as single LP Back In Memphis, RCA 4429. 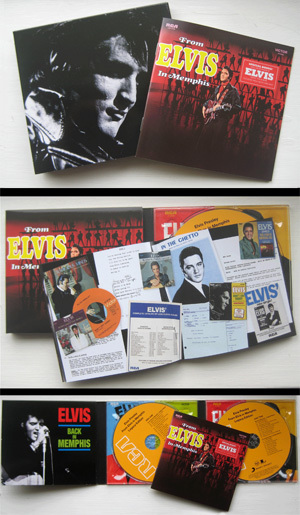 From Elvis In Memphis The Legacy Edition collects that entire American Studios output, and then some. The specially-designed 40th anniversary double-CD package will be available at all physical and digital retail outlets starting July 28th through RCA/Legacy, a division of Sony Music Entertainment. The extensive 2,400-word liner notes essay for From Elvis In Memphis The Legacy Edition was written by the homegrown Memphis team of Robert Gordon (whose books include It Came From Memphis and The Elvis Treasures, and whose documentary films include Respect Yourself: The Stax Records Story and Shakespeare Was A Big George Jones Fan: Cowboy Jack Clement’s Home Movies) and his wife Tara McAdams, author of The Elvis Handbook among other works. Individually, disc one of From Elvis In Memphis The Legacy EditionN includes the 12 songs of 1969’s original From Elvis In Memphis LP. Among these are “In the Ghetto” (written by Mac Davis, the song that jump-started his career the next year as a Columbia Records artist), and powerful covers of Gamble & Huff’s “Only The Strong Survive” (via Jerry Butler), Johnny Tillotson’s “It Keeps Right On A-Hurtin’,” Hank Snow’s “I’m Movin’ On” (famously covered by the Rolling Stones back in ’65), John Hartford’s “Gentle On My Mind,” and Burt Bacharach’s “Any Day Now” (via Chuck Jackson). These 10 songs are augmented by another 10 bonus tracks, grouped as The Original Mono Single Masters.